San Miguel de Allende is a city famous for its 17th and 18th century architectural style churches, monuments and buildings, surrounded by cobblestone streets and the harmonious balance of a joyful artistic life day and night and the modern entertainment options such as hot air balloon, handicrafts, art collectors features and antiques. Was recently declared "Historical Patrimony of Mankind" by United Nations (UNESCO). Also famous for its restaurants of different type ranging from Mexican, American, French, Italian, Chinese, to name a few. Less than 30 miles from this city the Mexican Independence movement from Spain started. San Miguel provided the very first military unit to join the independence cause in 1810. It´s renowned Gothic Style Facade of the main church unique in Mexico, known as " La Parroquia ". There are also many 17th and 18th century barroque and neoclassique style churches. Our new Penthouse Condo has the unique combination of colonial style featured in this renowned city, mixed with modern comfort and amenities to spend a relaxed vacation swimming, playing tennis or enjoying quiet strolls within the premises, exercising at the Gym, reading or writing in the ´Club House ´, using Wi-Fi internet , or watching movies, or top sports events in the wide screen ,as well as being at walking distance of downtown historical San Miguel. In this Penthouse you can entertain your friends and loved ones in the roof garden bestowed with open air Jacuzzi and grill while enjoying the breathtaking views of the mountains surrounding San Miguel, as well as the different ancient churches, including the famous " La Parroquia ". Puente Viejo Residential De Luxe Condo is the name of this new and affordable development within downtown San Miguel limits. We are a happily married couple, of a German born lady, raised in Mexico City and a Mexican long time executive who has live abroad performing top management assignments in the U.S., Argentina, Mexico and Peru. 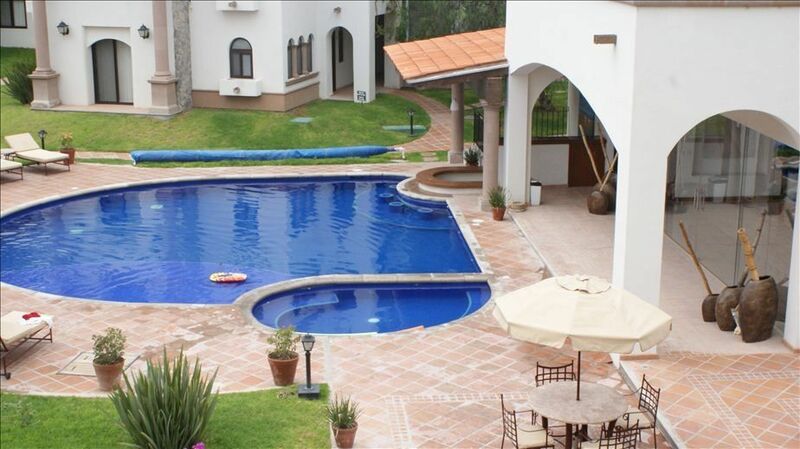 We currently live in Mexico City,but have been visiting San Miguel for many years and decided to buy this property. After about two years of continuously enjoying this Penthouse, we think that this site is perfect to be shared and clearly the best located of the whole Residential Development. We particularly enjoy having barbecues in the roof garden,as well as watching the sunsets over the Central Mountains of Mexico. We also take advantage of the priviledged location of this unit, frequently going to nearby excellent Restaurants and Art Galleries, like " La Aurora " the largest in San Miguel and the Handicraft large market, which are at convenient walking distance from the Penthouse. It is definitely the best VALUE FOR MONEY FOR THE TENANT! Tennis Court inside the property. New Condo Development fully respecting the classic Mexican Colonial Architectural Style .The best Located Penthouse of this Development. Within premises, at literally few steps from the unit's entrance, it has Swimming Pool, Tennis Court, Club House with Cable TV, Wireless High Speed Internet,Gym, Grill and ' Wet-Bar' at Poolside. The Penthouse Unit is provided by brand new amenities such as Jacuzzi, Charcoal and Gas Grill in the Roof Garden. 2 Bedrooms with full Bathrooms, TV Cable and Balconies. Living Room has its own balcony facing the Swimming Pool. Second Room has Mini-bar, Microwave and Tub. Also, 1 half Bathroom. Laundry Center (Washer and Dryer). Marble Counter in kitchen. Elevator and Stairs to access the Pent-house. Private Security 24/7 all year- round with interphone direct communication to the penthouse. Inside parking .A wide range of catering options at walking distance from the Pent-House ( from pizzas to ´haute cuisine ´Restaurants ). Really enjoyed time here, great pool, casa club, mini gym, grill etc all make for a great place to host parties or just relax. Centrally located in Col. Guadalupe, 10 minute walk to Jardin, accessible by both walking and bus. Close to Artisan Market. Comfortable apartment with three big beds and three bathrooms! Highly recommend this property to anyone! I had the pleasure of staying at this condo in beautiful San Miguel for Samana Santa and we could not have picked a better location. The condo is located within walking distance of the energetic centre of town, a car is not needed and taxis are plentiful. The property manager was available to answer any questions for us and was very prompt in fixing one very minor problem in the condo. The grounds of the complex are beautiful and very quiet, we enjoyed the pool everyday. I thought we might enjoy the rooftop terrace more but there are no comfortable chairs to lounge on and the jacuzzi was not clean so we chose to stay poolside, although in the heat of the day it was to hot on the roof for us anyways. The condos interior is very well appointed the beds were comfortable and the kitchen had all that we needed. The only downfall of the condo was lack of wifi, you could get wifi in the clubhouse and if you sat outside on the balcony but not in the condo, there is a router in the condo but it is not wireless. We enjoyed our stay very much and hope to return to San Miguel and this condo again. Hello! I stayed at this condo 3 weeks this summer and enjoyed it VERY much! It is conveniently located and very safe. There is full time security at the entrance and helpful staff. The condo is a straight 10 minute walk to the center of town. Also, the owner is extremely nice and helpful. I would stay again! I stayed in Puente Viejo for 3 weeks this summer with my two daughters. We all enjoyed our stay in the apt. The grounds are very well maintained and the staff helpful (and always on site).The apt is not far from the Jardin and a straight, pleasant walk. The apt is clean the furniture is not formal, allowing us to feel comfortable. We enjoyed the pool (although it did rain quite a bit). I found the owners helpful and very responsive to any needs we had. I would recommend the apt. and hope to visit again in the future. We spent a great week plus here while looking for long-term housing in San Miguel de Allende. The owners were extremely help and very prompt in answering any questions and resolving the only minor repair issue during our stay. The property is well maintained and had everything we needed to feel at home during our stay. In addition, it was a very easy and convenient to the Jardin and other downtown sites. We would definitely recommend the property to anyone wanting to spend time in San Miguel de Allende. Catholic and Protestant Temples nearby.